BACK IN STOCK Proto-Chip n' DIP 2 IN STOCK 5-24-2011!!! An improved version over the original Chip n' DIP. It is 3.5" x 5", has 544 DIP holes now on the side, for the addition of any type of discrete through hole device or connector, or other smaller breadboard/adapter, controller or microprocessor. Starting on top is VSOP 0.4 mm, then SSOP 0.635mm / 0.65 mm, then TSOP 0.5 mm, 0.55 mm, and the 0.25" SOIC/SOP pitch. 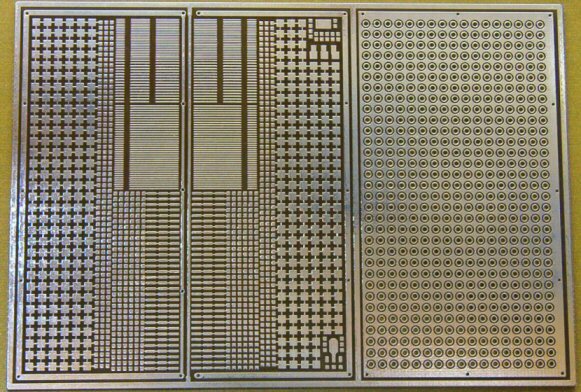 There are separations for the 0.4, and 0.65 mm parts to allow 3-6 chips on each pitch, depending on pin counts, and body width. It can also be used for connectors or putting SMD chip caps and resistors near the IC using the IC lead traces on the other side of the separation. You can also use the micro-pads, and the Proto-Chip pads for mounting anything you can dream up. SOT devices, 0603 to 1210 devices, regular leaded parts, test points, or just wiring pads or some SMD connectors. Don't be afraid to use 2 or more of the traces to solder a part to, or cut a few traces to fit what your pad size needs are. Its a PROTOBOARD! Use your imagination, someone has given you a means to solder those tiny leads to. It has a ground plane on the whole back side, and on the DIP area top side. Power and ground traces encircle the board and tie into the ground plane for better grounding and shielding. There are reports from a few customers using these for RF circuits with no problems at high frequencies. Short lead lengths are the key to that. That is why the traces are gone from this version, so you can make it the way you want it. 2 transistor footprints are on the corners for regulators or power devicces. More can be soldered to the Proto-Chip pads anywhere on the SMD side, or the DIP side. These boards are designed by a labrat, for labrats. Use the potential genuis hiding deep inside you, to figure out how many ways this board can be used. Cut it in half lengthwise, so you have a DIP and TSSOP footprint board by itself, and the SOIC and DIP part by itself. Cut off the DIP part, and just use the SMD part. Cut it up into smaller parts to rework modules for production, or a prototype build. OR, you can build up a few complete circuits on this board! I leave it to you to design your dream circuit!